Synopsis: Welcome to Gamindustri, a fantastical world where all your favorite video game consoles come to life! Neptune and her fellow Goddesses rule the four kingdoms of Lastation, Leanbox, Lowee, and Planeptune – but their royal duties often take a backseat to their obsession with gaming. When their button-mashing shenanigans are interrupted by rampaging monsters, hacker attacks, and killer eggplants, the goddesses must transform into stronger, sexier versions of themselves and fight for their right to game! The bosses get tougher as the game goes on, and the girls will have to work together in order to defeat a bewitching goddess of piracy, an anonymous master hacker, and an evil CPU hell-bent on destroying everything in her path – using any cheat code necessary! Contains episodes 1-13 in a chipboard art box. Special Features: Transform Collection, Textless Openings and Closings, Blu-ray/DVD Commercials, Commercials, Promotional Videos, U.S. Trailer, Trailers. Last edited by chrisc31; 06-18-15 at 05:33 PM. Ever since we announced our acquisition of Hyperdimension Neptunia the anime series, there has been one question that has been weighing on everyone’s minds–will you bring back the actors and actresses from the games? Well, while we couldn’t bring back EVERYONE, we are pleased to announce that we were able to secure the majority of the main cast from the games! Take a look below at the English cast. Based on the hit video game series about modern game consoles– anthropomorphized as cute girls! Welcome to Gamindustri, a fantastical world where all your favorite video game consoles come to life! Neptune and her fellow Goddesses rule the four kingdoms of Lastation, Leanbox, Lowee, and Planeptune – but their royal duties often take a backseat to their obsession with gaming. When their button-mashing shenanigans are interrupted by rampaging monsters, hacker attacks, and killer eggplants, the goddesses must transform into stronger, sexier versions of themselves and fight for their right to game! The bosses get tougher as the game goes on, and the girls will have to work together in order to defeat a bewitching goddess of piracy, an anonymous master hacker, and an evil CPU hell-bent on destroying everything in her path – using any cheat code necessary! Click here to watch subtitled episodes of the series now! And now an updated release date! Hyperdimension Neptunia will be available on June 9th. 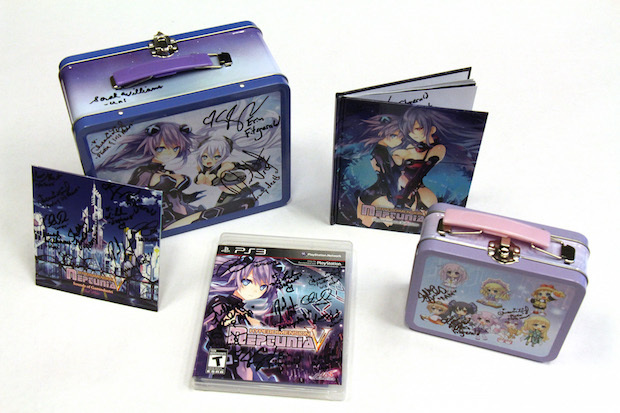 * We’ve also got an extra special treat for fans–If you pre-order Hyperdimension Neptunia from the FUNimation Shop, you’ll be automatically entered to win one of two Hyperdimension Neptunia Victory Limited Editions signed by TONS of your favorite actresses from the games and anime! Pre-order listings will be going up in the near future, so stay tuned for more details coming soon. Last edited by chrisc31; 03-19-15 at 07:42 PM. Is this an anime where you'll be lost if unfamiliar with the videogame series? No, I didn't buy a PS3 and the games until after I watched the anime. The story is pretty much the same in the anime as it is in the video games. Last edited by chrisc31; 06-20-15 at 12:38 PM.